Smart, sassy, and unapologetically feminine, In Praise of Difficult Women is an ode to the bold and charismatic women of modern history. 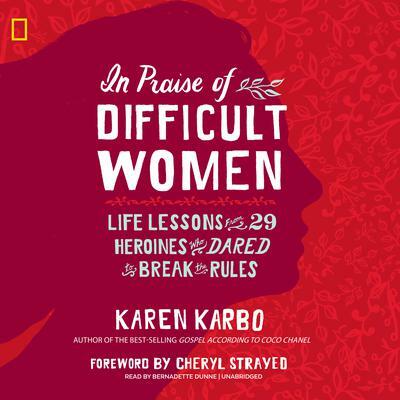 Bestselling author Karen Karbo spotlights the spirited rule breakers who charted their way with little regard for expectations: Amelia Earhart, Helen Gurley Brown, Edie Sedgwick, Hillary Clinton, Amy Poehler, and Shonda Rhimes, among others. Their lives—imperfect, elegant, messy, glorious—provide inspiration and instruction for the new age of feminism we have entered. 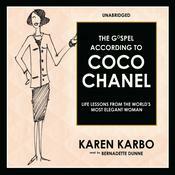 Karbo distills these lessons with wit and humor, examining the universal themes that connect us to each of these mesmerizing personalities today: success and style, love and authenticity, daring and courage. 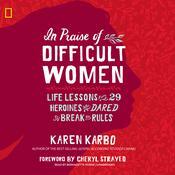 Being “difficult,” Karbo reveals, might not make life easier, but it can make it more fulfilling—whatever that means for you. Karen Karbo is the author of three novels, all of which were New York Times Notable Books; several nonfiction books, including The Stuff of Life, a People magazine Critic’s Choice; and a few books for young adults. Her essays, articles, and reviews have appeared in the New York Times, Entertainment Weekly, Outside, Elle, and Vogue.